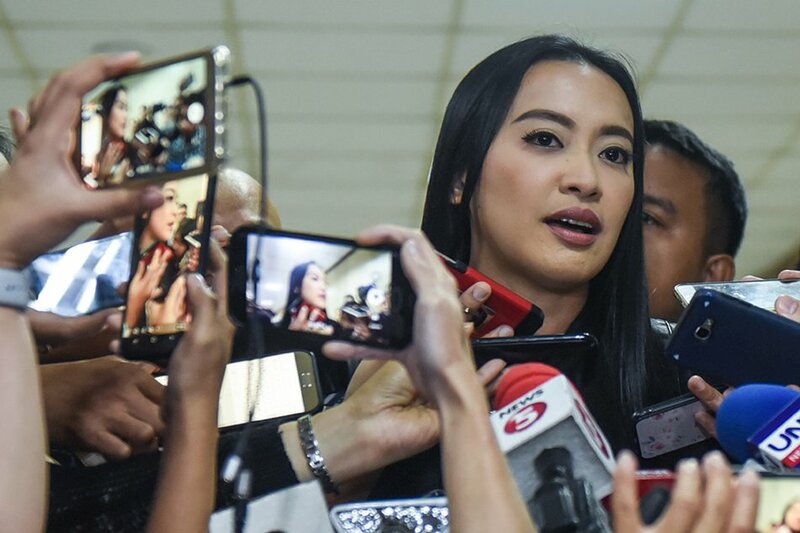 MANILA -- Following her resignation as communications assistant secretary, Esther Margaux “Mocha” Uson on Wednesday said she is open to run for a Senate seat, or even for a congressional seat, in next year’s mid-term elections. Uson, however, said her decision whether to run or not in the polls would depend on the sentiments of the people. “As President Rodrigo Duterte said, 'Let the people decide,'” she said during an interview after announcing her resignation during the hearing of the proposed 2019 budget of the Presidential Communications Operations office (PCOO) at the Senate in Pasay City. Uson, who enjoys a large following on social media, noted that Filipinos are now in Facebook, and she would know their sentiments there. “Kung ano po ang mababasa ko sa Facebook, kung ano ang sasabihin ng mga supporters doon, doon ko po titignan (Whatever I read from Facebook, what my supporters will say there, I’ll take it from there). Senator or Congress, open po tayo (we're open),” she said. Earlier, upon announcing her resignation at the budget hearing, Uson said unlike other lawmakers who use their positions for their own agenda, she said she is ready to fight for the voiceless masses in society. “Dadalhin ko ang laban sa Congress at Senado (I will bring the fight to Congress and the Senate),” she said. When asked by reporters to elaborate, Uson said she is willing to fight for the ordinary Filipinos in any arena. “Nakaka-frustrate e. Yung ilang mambabatas natin na andyan sila sa posisyon pero ang iniisip nila ay sarili nilang interes (It’s very frustrating. Some of our lawmakers there in position are just thinking about their own interests),” she said. “Kailangang magkaroon ng boses ang ordinaryong tao, at gagawin po natin yan kung sa anumang paraan na pupwede (Ordinary people should have a voice, and we will do that by whatever means),” she added. Uson tendered her resignation after lawmakers at the House of Representatives deferred twice the passage of the PCOO budget due to her absence in the deliberations. Several lawmakers wanted Uson to appear before Congress to answer the criticisms against her. However, she clarified that her resignation was not due to the criticisms, but to the “rotten system” perpetrated by certain lawmakers who do not want to be criticized themselves. “Gayun paman, ganun na po talaga ang sistema natin ngayon, taon-taon ay sinasabihan po ako na huwag punahin ang ilang mambabatas para huwag ipitin ang budget ng PCOO (Nonetheless, that is the system now, being told yearly not to criticize certain lawmakers so that they will not defer the PCOO budget),” she said. “Nakakaliit man ang sistema natin ng kasalukuyan, bulok man ito, ngunit kailangang sundin. Dahil po dyan, ako na po ang magsa-sakripisyo para maipasa na po ang budget ng PCOO. Ako po ay nagdesisyon na mag-resign na po (However demeaning and rotten the system now may be, it must be followed. Because of that, I am now making the sacrifice so that the PCOO budget would be passed. I have decided to resign),” Uson said at the hearing. Uson warned her critics that she would not be backing off anytime soon. “Para po sa mga bumabatikos sa akin, huwag po kayong magkakamaling isipin na nagtagumpay kayo. Hindi ako nagbitiw sa posisyon dahil takot akong harapin kayo. Gusto ko lang na pag nagkaharap tayo, patas ang laban (To my critics, don’t ever think that you’ve won. I did not resign because I am afraid to face you. All I want is that when we face each other, the fight would be fair),” she said.